Sleep didn't come easy last night. I prefer to think that it was due to the discomfort of over-eating, but am open to the possibility of some apprehension. After all the months of planning, the reality is now here. I'm going to do this thing which, until now, has been cloaked in the comfort of mere talk. I'm up at 5:00 am to a moderate dawn chorus. This is not my usual rising hour, but no doubt will become routine as the first light wakes me in the coming weeks. It still seems surreal that I'm heading out for a month. My wife, Viveka, and I drive the three hours from our home in Addison, VT, to Old Forge, NY, the western terminus of the Northern Forest Canoe Trail. 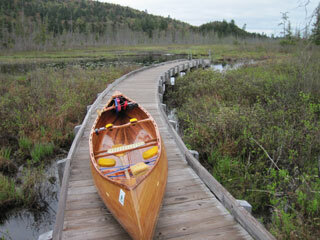 The canoe is kitted out with bungee and other straps to hold in paddles and poles on portages. We also have Viveka's bicycle on the rack; she's going to take the opportunity to ride around the Fulton Lakes region, rather than turning round and heading straight home. 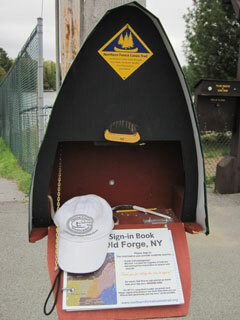 Old Forge is buzzing with attendees of Paddlefest, but when I try to visit the NFCT stand, I'm turned away at the gate because I haven't paid the entry fee. As I'm not planning to stay, and really have other ambitions on my mind, I decide to save the money and to forego the visit. The canoe is now off the car, receiving admiring comments from other paddlers. I never tire of these. Then it's time to sign into the register and to take the obligatory posed photos before a somewhat emotional farewell. It's not that we're not going to see each other for ages – we have tentative plans to meet as I cross Lake Champlain, and we're playing a music gig together in the Connecticut Valley in two weeks' time. Rather, I think we're both aware of how much this trip means, and the realisation that it's now beginning makes an impact. 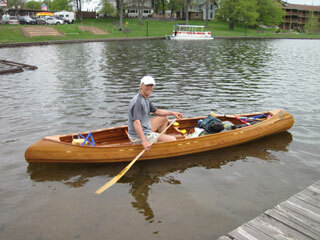 A little after 11:00 am, I send a SPOT signal and take the first real paddle stroke of the journey. 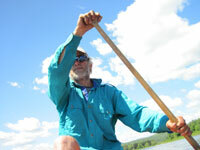 A few more tears roll down my cheeks as I paddle out into First Lake. At first I check the minutes – 15 minutes, so I must have travelled a mile by now; only 739 to go. Then the watch loses its fascination as I settle into a rhythm of paddling that my body knows so well, and which will be my ever constant companion for the weeks to come. A little less than two hours after departure, the dark clouds that have been gathering finally drop rain on me, and a headwind springs up on Fourth Lake. I smile at the irony: the first two weeks of May were warm and absolutely dry, so I have been concerned about water levels. I've been hoping for some rain, and now it's here. Oh well, it was unrealistic to hope that it would be warm and sunny every day of the trip. I reach Inlet and Fifth Lake and the first carry of the trip, less than half a mile to Sixth Lake. My pack is heavy, containing food for the first two weeks, heavier than I like, and my legs complain. They're just not warmed up yet. Sixth and Seventh Lakes pass under grey skies. I'm surprised by some shallows near the east end of Seventh Lake. On the carry to Eighth Lake, I become aware of a sore patch on my left heel. Closer inspection reveals that I have rubbed skin off behind my achilles tendon. I'm annoyed with myself – why didn't I stop sooner before it got this bad? Would a bit of body care really have disrupted the flow of the journey so much? Maybe it's good to learn lessons early, though. 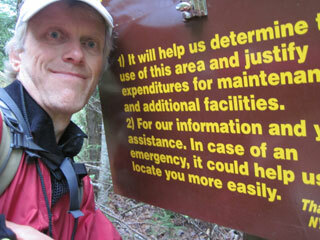 At the north end of Eighth Lake, I reach for the first aid and tape my heel before the carry to Brown's Tract Inlet. This is now familiar territory. I sign into the DEC register part way along the carry, clean out my canoe as well as possible to avoid transferring invasive species, and then continue to the board-walk that leads out into Brown's Tract Inlet. Going down Brown's Tract Inlet, I can generate enough speed to shoot four beaver dams; they are breached enough to allow this, provided I shift my weight forwards at the right time. 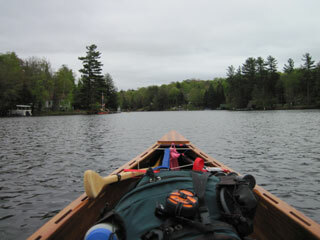 And after seemingly forever in the serpentine slack water, I emerge under the bridge into Raquette Lake. It's late on a Sunday, so there's no chance of the store being open, but I have more than enough food. 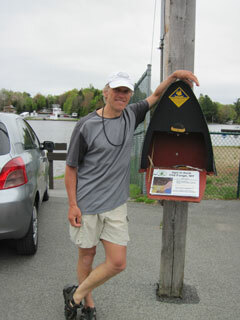 The NFCT sign-in box is not yet installed, so I photograph myself beside the kiosk instead. There's a challenge to reach as many as possible of the sign-in boxes this year – I should be in a good position to reach all that exist. Competitive? Me? My first thought was to camp on Big Island, but now I aim for the Hen and Chickens Islands farther north, a haunt from last summer. That plan evaporates when I spy a lean-to in Beaver Bay, and head directly there, pulling in shortly before 6:00 pm. It crosses my mind that, so far, this is merely a day trip. By tomorrow, it will have become a camping trip. Now it's time to put the wood stove into action. I gather small sticks, breaking off any side twigs, assemble the stove, add some tinder and light it. Within a matter of minutes I have a pan of water heating, and the first of the meals that Viveka has prepared for me is on its way. I know, it sounds so politically incorrect – wife prepares meals for husband, even when he's away! But we each have our skills, and the meals will taste much better for having been prepared by her. Before long, I'm tucking into a tasty tagine. So far, so good. I don't bother with the hammock, but merely put sleeping bag and mat down in the lean-to; the bugs are not too bad. A brief phone call to Viveka – yes, I relented and got a SIM card for my phone – rounds off the day. It's been mainly cloudy with some rain, I've covered more miles than planned, and the only damage so far is some lost skin.